Size has always mattered to BJD Crushers, but never more so than with the introduction of the new BJD MINI-MILL series to complement the company’s comprehensive range of crushing and sizing equipment. The history of BJD Crushers' involvement with design and manufacture can be traced back to the early part of the 20th century and, with vast experience gained through worldwide installations on a diverse range of reduction applications, BJD Crushers have earned a reputation for rugged build quality, high throughput, and low operating costs. The ubiquitous BJD Hammer Mill is no exception – its reliability and efficiency in a multiplicity of industrial applications is renowned, and the new BJD MINI-MILL series is bred from the same stock. Material is gravity fed through the feed chute into the grinding chamber where it meets with rows of steel hammers attached to a rotating shaft. The material is crushed or shattered by a combination of repeated hammer blows, collisions with the grinding chamber walls, and particle on particle impacts until the desired size is achieved and finally discharged, through a screen arrangement, as finished product. The BJD MINI-MILL is manufactured from high grade steel plate, with long-life wear resistant steel liners, and is available in 3 base size variants – appropriately named MINI-MILL No1 (7x8), MINI-MILL No2 (15x8) and MINI-MILL No3 (20x12). Depending on feed material composition and desired end product size, each model is configured to order and fitted with a choice of rigid, fixed or slugger hammer types to suit specific duties. Compact in structure, with minimal wear parts and easy maintenance, the BJD MINI-MILL offers a large crushing ratio, excellent production efficiency, and uniformity of product size. Maximum feed sizes range from 50mm for MILL No1, and up to 100mm with MILL No3, with product down to micron-sizes, depending on duty. 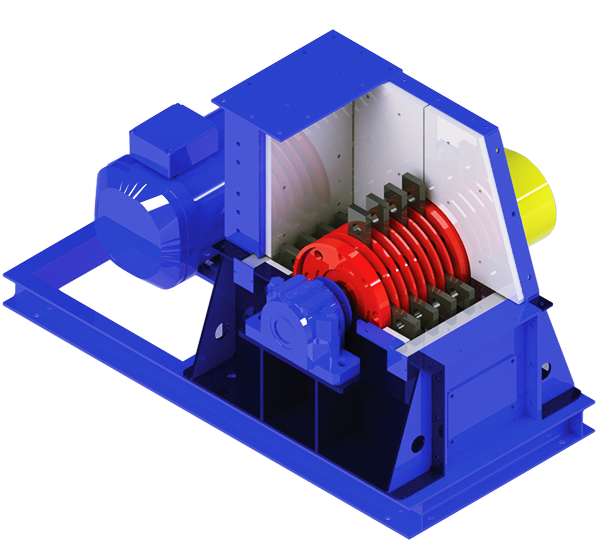 Power for the BJD MINI-MILL series is provided via V-belt drive from an integrated, single or three-phase electric motor – with options from 3.0kW to 22kW to complement mill size and application. The complete drive and crusher package is built onto a rigid steel base frame, with full protective guarding. The unit is CE marked and covered by 12 months manufacturer’s warranty and, if required, the BJD MINI-MILL can be supplied as a standalone unit. Applications for the BJD MINI-MILL series are diverse, but typical users include: Animal Feed Producers, for reduction of various cakes and food waste; Fertiliser Manufacturers, grinding potash and phosphates, for example; Plasterboard Recycling facilities; Wood Waste Processors reducing wood chips for biomass fuel; and Food Manufacturers, for such tasks as pulping fruit and vegetables, and even for production of chocolate crumb – BJD Crushers are the global supplier of size reduction equipment to a major international confectionery manufacturer. For information on specific applications for the BJD MINI-MILL, or for more details of machine specifications, please call BJD Crushers Ltd on +44 (0)1226 241 425 or email your enquiry to: sales@bjdcrushers.co.uk.